More than a century of American military history. While it is perhaps best known for its U.S. Army War College Library, U.S. Army Military History Institute, and Historical Services Division—where many of the world’s leading military historians and authors have spent countless hours poring through the Center’s unparalleled holdings and collections consisting of many millions of personal papers, archival materials, photographs, maps, books including rare volumes, audio-visual, and digital materials—USAHEC also houses the 7,000-square-foot Army Heritage Museum. 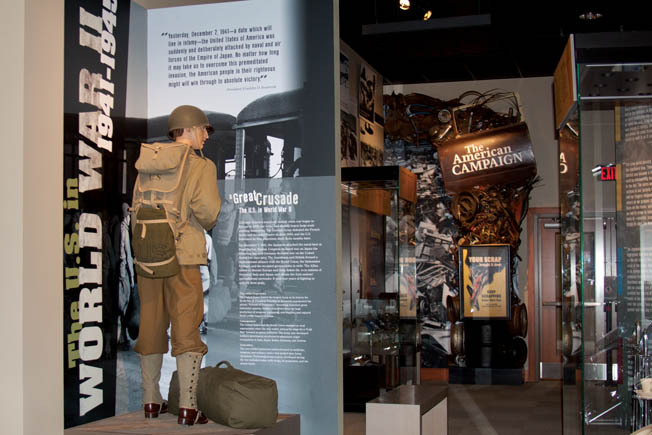 Entering the WWII exhibit area, filled with carefully selected photographs and artifacts, visitors are immersed in the U.S. Army’s efforts to achieve victory in both the European and Pacific Theaters. Here the history of the U.S. Army, from its early days to current-day operations, comes alive with a number of interactive exhibits, as well as artifacts and photographs. Visitors first stop by the information desk to pick up a “dog tag” representing one of six soldiers whose story is part of the USAHEC collections. Guests use the dog tag to experience Army life as a soldier does, learning about their soldier throughout the gallery. 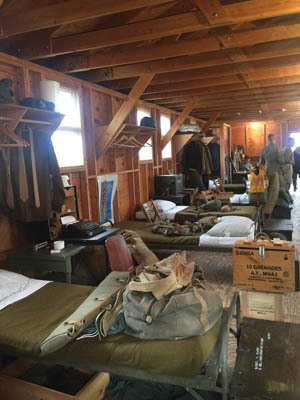 The interior of a barracks has been authentically outfitted to demonstrate what garrison life was like. Entering the Soldier Experience Gallery, visitors experience the U.S. Army through the eyes of the men and women who lived its history, in war and peace, from the Spanish- American War to recent operations in the Middle East. The museum also features hundreds of artifacts, oral history recordings accessible from a smart phone, plus a movie theater, and the opportunity to write a letter to a currently serving soldier. In addition, guests may test their marksmanship on the digital shooting range, parachute into Normandy as part of the D-Day invasion, and experience a night attack during the Korean War. USAHEC’s events and programs include a lecture series, workshops, historical demonstrations, the Omar N. Bradley Memorial Art Gallery, and several special living-history events at the adjacent mile-long Army Heritage Trail—an outdoor museum that features artifacts ranging from the French and Indian War to Operation Iraqi Freedom, including military vehicles, World War II barracks, an obstacle course, a Normandy scene, a German pillbox and antitank gun, a Sherman tank and, on special weekends, uniformed re-enactors representing various eras in re-created encampments. 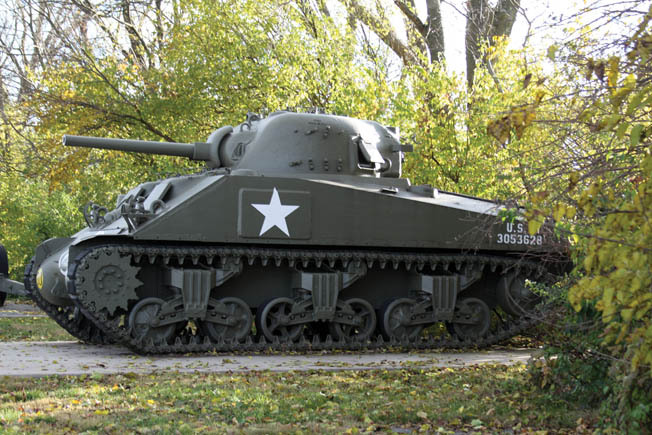 This Sherman tank is one of many vehicles on display that show the mobility of U.S. Army forces over the decades. And, for those with an interest in the Civil War, USAHEC holds the nation’s best collection of Civil War books, Civil War photos, and Civil War soldiers’ unpublished personal letters, diaries, and memoirs. Moreover, Gettysburg is just an hour’s drive away, as is the National Civil War Museum in Harrisburg. The museum, the research library, and all USAHEC-sponsored events are free and open to the public. Tags American, antitank gun, army, battlefield, CIA, civil war, civil war battle, civil war battlefield, civil war battlefields, civil war photos, civil war soldier, civil war soldiers, D-Day, Europe, Features, French, french and indian war, German, Gettysburg, india, Iraq, Korea, Korean War, memoir, military, military historian, military history, military history institute, museum, Normandy, Operation Iraqi Freedom, Pacific, Pacific Theater, Sherman Tank, Tern, the civil war, the d-day invasion, the french and indian war, the korean war, the wwii, Thor, Tory, US Army, Wii, World War I, WWI, WWII.